A Wearside school which became the first in Europe to use a futuristic eye-scanner has scrapped the scheme because it was too slow. Venerable Bede Church of England School in Ryhope, Sunderland, introduced the hi-tech system to take away the stigma felt by pupils entitled to free meals. 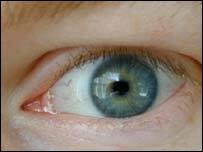 The scanner was able to identify pupils anonymously by taking a picture of their eyes. But the scheme has now been replaced by swipe cards because it was too slow. Headteacher at the school, Dr Ed Yeates, said he hoped to bring back the system in six to eight months after "teething problems" had been ironed out. He said: "The system was world-beating, but too slow and was only working at 50% of its capacity. "We were aiming for it to scan 12 pupils a minute, but it was only managing five so has been temporarily suspended as we do not want pupils' meals getting cold while they wait in the queue." The system, which was introduced a year ago, worked by getting youngsters to look in to a camera for a few seconds while the image was cross-referenced to a database. Around 90 of the 575 pupils who attend the school are entitled to school meals. Dr Yeates added: "Many pupils used to be too embarrassed to claim free meals because they felt singled out and easily identified. "We hope to have the system back in the canteen soon." The system has now been returned to the manufacturer, CRB Solutions, for modifications.